~ ~ ~ EPC Updates ~ ~ ~: Worried About Flooding? Check Out the Advanced Hydrologic Prediction Service! Worried About Flooding? Check Out the Advanced Hydrologic Prediction Service! In recognition of floods as the nation's most costly natural disaster, the National Oceanic and Atmospheric Administration (NOAA) and the Federal Emergency Management Agency (FEMA) have been promoting March 12-16 as " Flood Safety Awareness Week". As such, NOAA's National Weather Service (NWS) has put in place several websites with related safety information. The most notable of these is TADD (Turn Around Don't Drown), a site which promotes awareness about the dangers of fast moving flood waters. 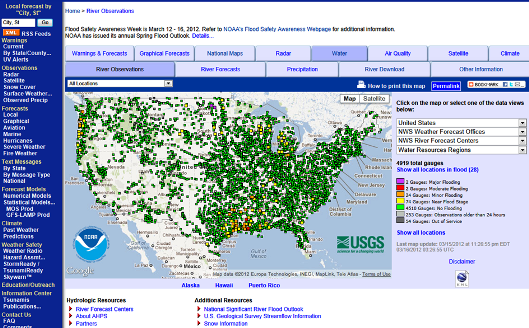 But beyond this safety outreach campaign, there is NWS's Advanced Hydrologic Prediction Service (AHPS, pronounced A-Haps); a geospatially driven system that provides near real-time river gage information and forecasts so the nation's emergency managers can make effective decisions when dealing with flooding scenarios. To take AHPS for a test drive, click here. Comment: AHPS is a geospatial product with many layers of information. To grasp the level of detail available, be sure to click on graphic items until descending hyperlinks are no longer available. Note also the various selections available in the menu bars along the top of the viewing area. As a side note, as of the date of this post, there are only two U.S. Geological Survey stream gages reporting major flood stage (purple). Both are associated with the Devil's Lake watershed in Eastern North Dakota. Given how warm and dry this past winter has been in the upper Midwest, that indication should give most folks cause for thought. Devil's Lake is a nationally unique site that has been on FEMA's (and the Department of Defense's) national watch list of potential disaster sites for more than a few years. It's a lake of mammoth proportions with no natural outlet - and its been steadily rising since the 1940's. Now, it's within a few feet of over-topping a series of U.S. Army Corps of Engineer dikes that have been built as high as they can structurally go (the height of a pyramid depends on the size of its base). Potential solutions continue to be worked - hopefully they will be in place before bad things can happen.